Reading chairman Sir John Madejski says the club are close to finding new investors, which could lead to majority owner Anton Zingarevich selling up. Madejski Stadium sources have told the BBC that there is an "ownership issue." Zingarevich has not been seen at a game since 17 August and formal talks which could lead to a sale have been going on for several weeks with new investors. 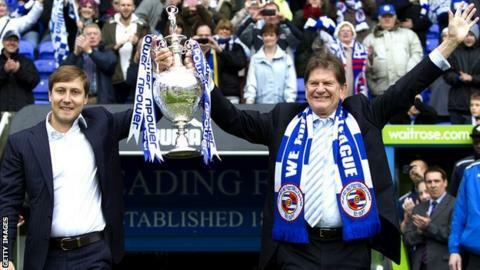 "Anton is still the owner of the club as such - per se," Madejski told BBC Radio Berkshire. "I think every club is always looking for that eventuality [new investment] and we at Reading are no different. "We are confident about the future and we are looking forward to going into the future at that level - so we are singing off the same hymn sheet. "We are always looking for potential new investors and that never stops, no matter who the owner of the club is. We are making very good progress with that." Russian businessman Zingarevich bought 51% of the club in May 2012 and was set to purchase the remaining 49% of shares from Madejski in September but failed to complete the deal. "Chief executive Nigel Howe is the key man right now. He's busy exploring every potential new ownership option globally. "Anton Zingarevich last watched Reading in the Championship on 17 August. As someone who sat next to him watching every minute of every training session during the pre-season tour of Portugal, I can only describe his non-attendance in the last four months as unscheduled and alarming. "It has become increasingly obvious Sir John Madejski continues to be the glue holding the club together." Madejski admitted he did not know when Zingarevich would return to Reading but said he was not concerned about their future involvement. "He has a great affection for the club but I do not know when he will be back to be honest," he added. "I am not concerned about the Zingarevich family. They support Reading and will continue to do so in the future." The Berkshire businessman also added that funds would be available to the manager Nigel Adkins in January, but said it would be a "combination" of his and Zingarevich's money. Adkins himself said he was unconcerned about the uncertainty surrounding the future ownership of the club and was fully focused on steering Reading to promotion this season. "What will transpire will transpire," Adkins told BBC South Today. "Whatever happens at the football club, around the football club, will take care of itself." Since the Russian became involved with the club in January 2012, Reading have been promoted to the Premier League, relegated back to the Championship and have also changed their manager. Promotion to the top flight in 2012 earned the Royals an estimated £90m, with half that money coming from television-related revenue. However, the club were relatively frugal when strengthening the squad for the Premier League. In total, they spent less than £10m in attempting to cement their status, with the £2.4m purchase of Adrian Mariappa from Watford their biggest outlay. Relegation last season meant the club missed out on the new £5bn global television deal, which would have earned them upwards of £100m, but Reading will still receive in excess of £60m over a four-year period in parachute payments. Reporting by Tim Dellor, Tony Husband and Nabil Hassan.